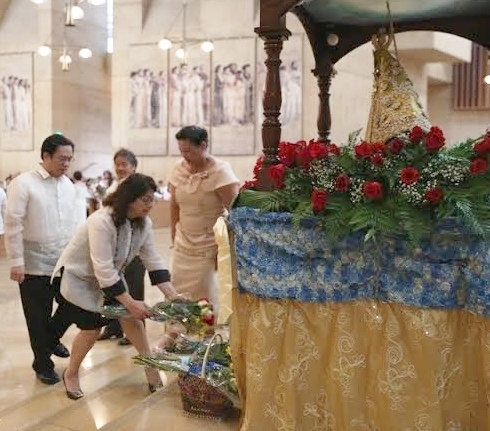 Consul General Leo Herrera-Lim and wife, Fidelis Carino, offer flowers to the Sto Nino. The officers and staff of the Philippine Consulate General in Los Angeles attended the 10th Archdiocesan Filipino Marian Celebration of the Santacruzan held on May 11 at the Cathedral of Our Lady of the Angels in downtown Los Angeles. Rev. Alex Aclan of Los Angeles led the Eucharistic celebration with the auxiliary bishops and clerics of Los Angeles. This year’s event was held under the auspices of the Filipino Ministry of the Archdiocese of Los Angeles. The Consulate General joined the different parish ministries, Catholic associations, civic and non-governmental organizations and Filipino-American children as angels in the Procession that heralded the Eucharistic celebration. © 2014 The FilAm Los Angeles. All images are copyrighted by their respective authors.